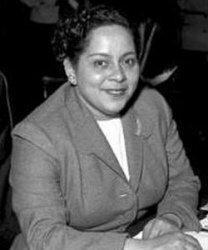 First African American female in the United States to be elected to a State Senate -- the Michigan State Senate (1952-1956). This pioneering soror served as President of the Senate (1955). She was appointed as the Special Associated General of the United States Post Office where she served the remainder of her working career (1957 - until retirement).